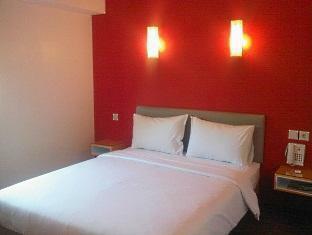 The Amaris Hotel Panakkukang is perfectly located for both business and leisure guests to Makassar. With the guests' convenience in mind, each of the 94 guestrooms at the hotel is well designed and fully equipped to cater to the demands of corporate and holiday travelers looking for unique accommodation in Makassar. Each of the hotel's guestrooms offers non smoking rooms, air conditioning, desk, internet access (wireless), in room safe, television LCD/plasma screen, shower. The basic amenities provided at this Makassar accommodation comprise elevator, laundry service/dry cleaning, meeting facilities, room service, safety deposit boxes, hotel/airport transfer. For guests to unwind, the hotel offers a variety of facilities and services including massage, garden. Being one of the good quality hotels in Makassar, guests staying at this hotel will find its convenient location and tranquil atmosphere pleasurable. Make your reservation at the Amaris Hotel Panakkukang Makassar now by selecting your chosen dates of stay and submitting our secure online booking form.